We are proud to introduce our dental floss pick machine to the world--- a vertical type injection molding machine. Having improved in terms of the operation, stability with speed and preciseness, space saving, robot and other automatic equipment interfaces and many others, this machine now has high performance in producing dental floss pick. In terms of safety improvements, the machine comes with three-aspect safety protection as standard: injection, clamping and electric power. A new stage for the Injection Molding Machine is always set to open. 1. Verltical clamping, adopt dual oil cylinder, high speed rnould closing, verltical injection, product with high quality, high precision. 2. Adopt imported oil pressure accessones, action fast, acculate, steady. 3. Adopt imported oil seal, no oil leaking, long operating life. 4. Professional garment hanging accessaty model design, efficiency, precision, mold include knife, it can cut the thread automatically, operating easier and convenient. 5. Integrated design for garment hanging accessory & golden stamping machine, computer program, instruction clear, operation easy, production efficiency. We offer information of product/molds dimensions/operating materials/technical data sheet, we will make a recommendation and comparison molds to you. 2. We provide OEM service to our customers. 3. Automatic auxiliary customized device. such as mechanical hand for product taking out and insert accessory putting in, auto roll material feeder for garment hanging tag, or efficiency-promoted options in machine structures design like rotary table and slide table, as well as servo adopted. In some case, professional technical support will be needed, such as first time parameter or live emergency fault clearing. You can both inquiry on line or email us. Immediate response will be available during working hours. 5. Warranty & after-sales service. We provide one year warranty for machine & accessories, delivery charges of parts replacement on customers. We can also provide overseas maintenance support to our customers, flights & living costs on customer. Dongguan Tiancheng Machinery Co., Ltd., established in 1999, locates in Dongguan City (world-famous manufacture base), covers an area more than 8000m, owns advanced facilities, professional technical team & modern manage system. Product range covers from standard type, rotary, slip form, two color, Bakelite, BMC, liquid silicone, to plastic injection around equipments such as material dryer, suction feeder, mould design, automatic mechanical. 1. Super strong R&D, with several Patent Applications of Automatic Production Auxiliary Equipments (injection molding machine around). 2. Thrifty/Simple working style, Aggressive investment in production facilities & work flow planning, offer customer highly qualified machines & moulds at most reasonable price. 3. Customer mainly covers over Asia, Southern America, Eastern Europe, including Samsung, Flextronics, COSONIC, CLIP, etc. Engineers are available to serve overseas. One- year Warranty as basic, plus Worry-free After-sales Service (online messager/email/phone call Q&A, detail Graphic instructions, troubleshooting demonstration video, etc.). a) How can I place order? b) How can I pay you? A: After you confirm our PI, you can pay through T/T (HSBC bank) and L/C. c) What`s the order procedure? A: 1. First we discuss order details, production details by e-mail or online consultation (Wechat / WhatsApp). 2. Then we issue an PI for your confirmation. Customer should makes payment deposit before we enter production. 3. After we receive the deposit, we start to process the order. 4. Before production has been finished, we will contact you for machine details video to confirm and you should prepare the rest payment. 5. After the rest payment has been received, we start to ship out the goods for you. d) How do you control quality through production process? A: We have spot inspection and finished product inspection. We check the semi-finished goods before they go into next step production process. e) How do you handle when your clients received defective products? A: We offer one year warranty, and unartificial damage can be replaced free for charge. If you have a small problem, we will help you by send a video or a graphic. Anytime you has question, you can seek advice from phone call or online consultation (Wechat/ WhatsApp). Dongguan Tiancheng Machinery Co., Ltd., established in 1999, locates in Dongguan City (world-famous manufacturing base), covers an area more than 8000m2, owns advanced facilities, professional technical team & modern management system. Product range covers from standard type, rotary, slip form, double color, bakelite, BMC, liquid silicone, to plastic injection around equipments such as material dryer, suction feeder, mould design, automatic mechanical. Abundant overall ability ensure Tiancheng's advantages in technical ability, machine quality as well as competitive price. The persistent pursuit in high-quality service, makes Tiancheng a reliable brand name in the injection molding machine industry. Tiancheng holds the faith of meetting customers'needs as own responsibility, in order to fulfill this commission, TC insists on constant pursuit of innovation and strive to be perfect, achieved a win-win situation from time to time. 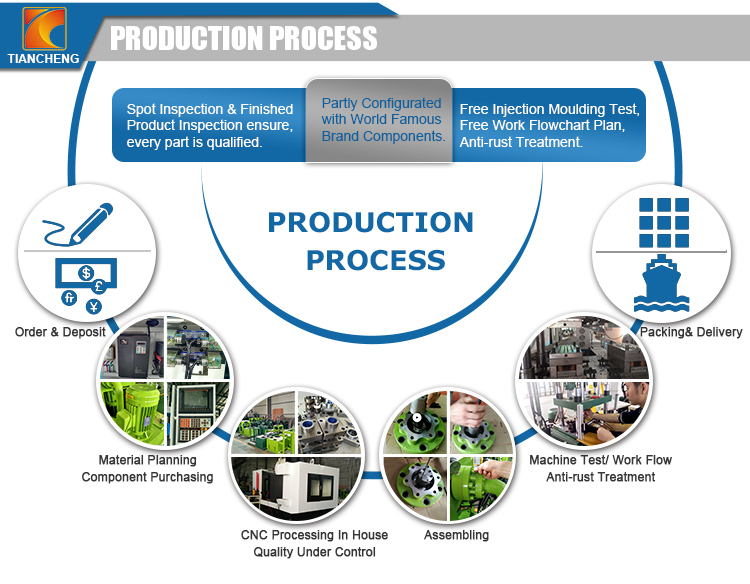 Ever since establishment, TC upholds the marketing phylosophy of earn reputation by quality, build up brand with reputation, break into main market with own brand, serious in internal management and after-sales service, focus on scientific and technological progress and technological upgrading, strictly control the quality of each process from parts to finished products, meanwhile organize production with a standarad higher than the industry level, adopt reasonable suggestions from the vast number of users, grasp the pulse of the market, bring up injection molding machine with even more excellent quality, safety performance as well as humanization. We developed a variety of energy-saving models, takes in advantages of different areas to meet the client's professional requirements of different products. 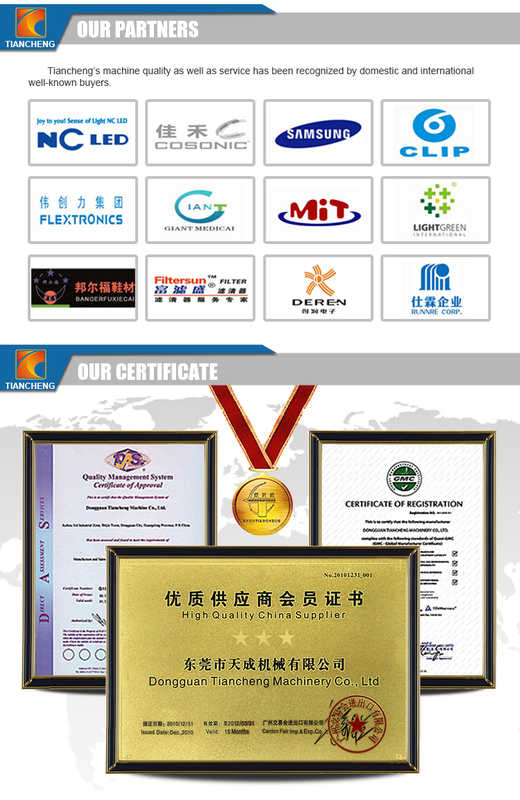 TC as a most trusted partner, provides customers with a wide range of professional services, reaching the win-win phylosophy of Tiancheng, we sincere, you succeed. Highly valued morality and pragmatism, broad minded, sincere in cooperating and creating a shared future, Tiancheng builds up a close interaction economic network with members from HongKong/ Macou/ Taiwan in strong faith, products sold throughout Asia/ Europe/ Africa countries (such as Germany, Russia, India, Vietnam, Egypt, Tanzania etc) & synchronize globally. Company Name: DONGGUAN TIANCHENG MACHINERY CO., LTD.